They look like a perfect family – two attractive parents, a blonde daughter and an adorable little boy – but you can tell they have problems. On the first day of their ski trip to the French Alps, the wife complains to a stranger that her husband has been spending too much time at work. The kids display some adult-sized anger issues and are in need of discipline the parents seem unwilling to provide. Tension hangs in the air like the thick fog of snow. The conditions are perfect for skiing, and also for a single incident to tear down the delicate pretenses of their marriage and indeed the very idea of domestic life. When that inciting incident occurs in Force Majeure, a darkly hilarious Swedish film that won a top prize at the Cannes Film Festival, it is one of the most gripping moments you will see in a film this year. The family – Tomas (Johannes Kuhnke), Ebba (Lisa Loven Konsgli), and the kids – sits at an outdoor café nestled in the snow-covered mountains, when a controlled avalanche starts rolling towards them. They start gawking and snapping pictures, but soon they realize its coming closer than it should. Just at the moment of impact, the husband grabs his cell phone and runs, leaving his wife and children to fend for themselves as the entire restaurant becomes covered in snow. The scene is filmed in a single, unbroken shot, which serves two distinct but equally important purposes. It makes the incident feel indelibly real – there are no cheap cutaways to hide special effects – but it also gives the viewer a seemingly objective perspective of what happened. This is important because in the days that follow, Tomas and Ebba will tell different versions of this story to their friends, each of them trying to mythologize the event in the terms most favorable to them. Tomas pleads ignorance as to his cowardly actions, claiming that he did not in fact run away, but Ebba is unwilling to let him slide. She twice calls him out on his cowardice in public, and even forces their friends to play jury, showing them footage from his iPhone to determine his actions once and for all. But nothing is settled. In the isolation of the mountains, the marital discontent builds. The fights escalate, and it starts to feel as if there may be no returning to the way things were. To Ebba, Tomas has failed at his most basic duties as husband and father, and his inability to cop to his failures only compounds the issue. Given our clear perspective, it is hard for us to disagree, but director Ruben Östlund turns the strife into an incisive and hilarious experience. At its most enjoyable, Force Majeure is a black comedy, a cornucopia of domestic awkwardness that will leave you laughing but hardly in good spirits. It is also a treatise on manhood in the modern age, not unlike Gone Girl, which was released earlier this month. Both films hone in on the battle of the sexes that is present in most marriages, but they also demand to be placed in a larger social context. Ours is an age in which gender roles are being challenged on an increasingly regular basis. The feminist arguments that for years played out in courtrooms and legislative chambers are now being heard in pop culture. Consider the dozens of thinkpieces written about Gone Girl, the Internet outrage over the lack of female superheroes, and the renewed interest in the Bechdel Test, which measure a film’s commitment to gender equality by a few key barometers. 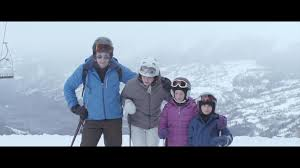 Force Majeure dramatizes this discussion, showing on a small scale the impact of a larger, more widespread shift in gender roles. What happens when the man loses his standing at the top of the family? Rather than reinforcing the old patriarchy with a cautionary tale, the film suggests that the false structure is domesticity itself. Through the arguments between Tomas and Ebba, the cannons ring out between the mountains, reminding us that forcing an avalanche is as dangerous as starting a family. 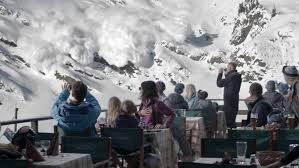 Force Majeure exposes the inability of our human systems to protect us from nature’s fury, both inside and out.